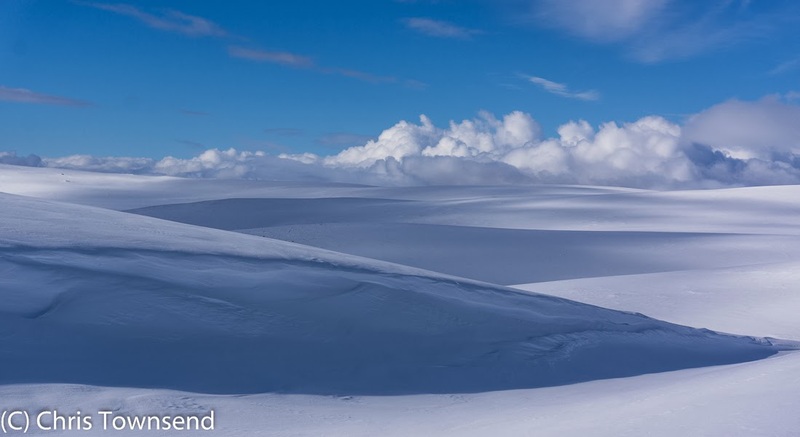 A few days ago I wandered up onto the Cairngorm Plateau on a day of sunshine and drifting clouds. The blue of the sky and the brightness of the high sun told of the changing seasons. Out of the cool easterly wind the air was warm. Round the edges of the Plateau the snow was thawing and the streams were full with the melt. 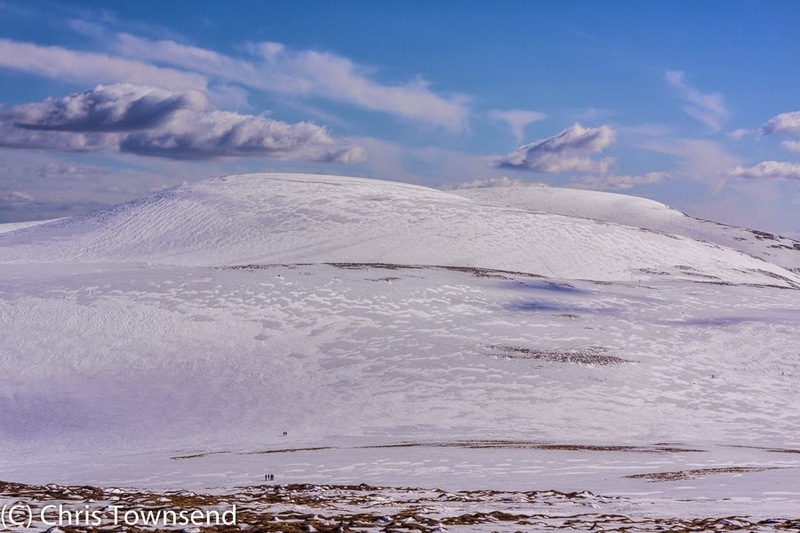 Previous mild days had stripped the snow from many of the summits and exposed ridges but the heart of the Plateau was still white, a whiteness that shimmered and flashed in the sunlight. This was because the snow, as I quickly found, was very icy, requiring crampons for security. 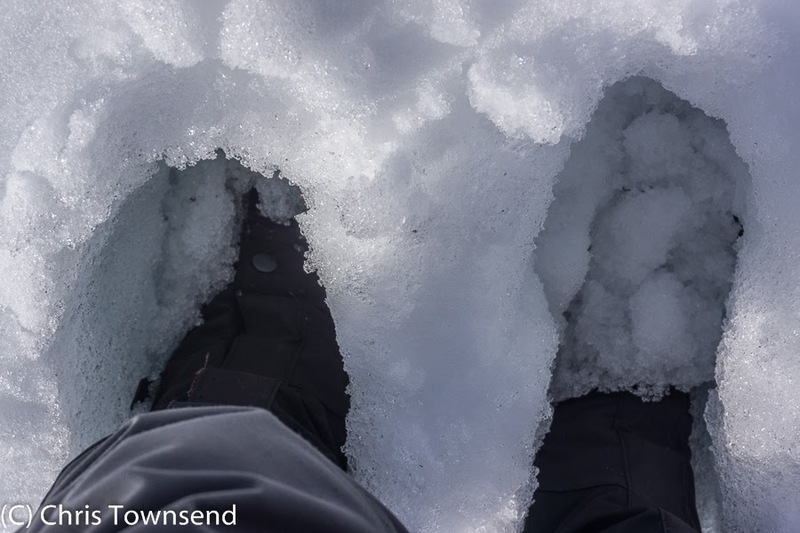 Although there were still big deep drifts in the hollows and corries much of the snow was also very thin with rocks poking through. Much more warm weather and it will be gone. 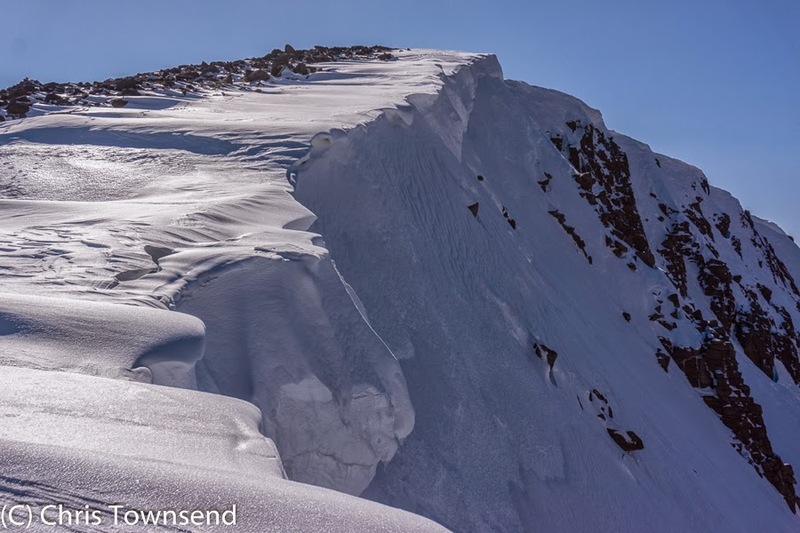 Huge cornices hung over steep edges, looking ready to collapse. Pairs of ptarmigan, some half white, half grey as they began the change into their summer plumage, scuttled across the rocks. A large flock of snow buntings fluttered low over the snow. Down in the corries there was a hint of green. There was a feeling of change, of anticipation. Distant views faded away into haze, the sharp clarity of clear winter days gone. The hard snow crunched under my crampons, the only sound. Looking south from Ben Macdui white hills faded into the distance. 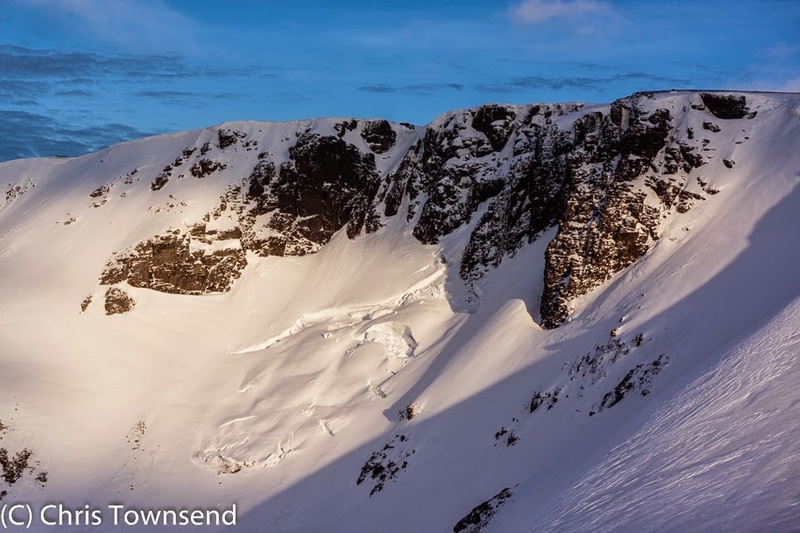 As the sun sank towards the mountains I returned across the Plateau and cut below the great north face of Cairn Lochan. Here in the area of the corrie wall known as the Great Slab the deep snow had cracked and sagged, leaving crevasse - like splits. 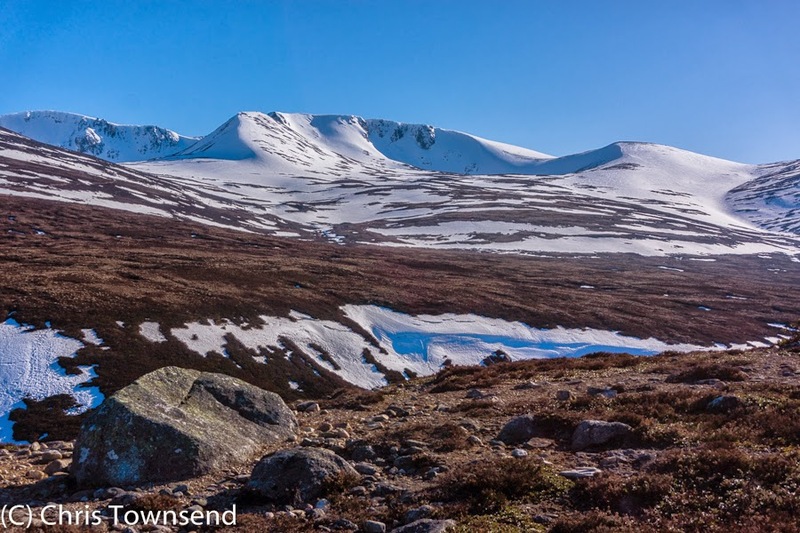 Earlier in the year scientists from Dundee University said the Cairngorms could have had glaciers as late as the 1700s and that Coire an Lochain was a likely place for the last one. Looking into the corrie I could believe the glacier had returned. 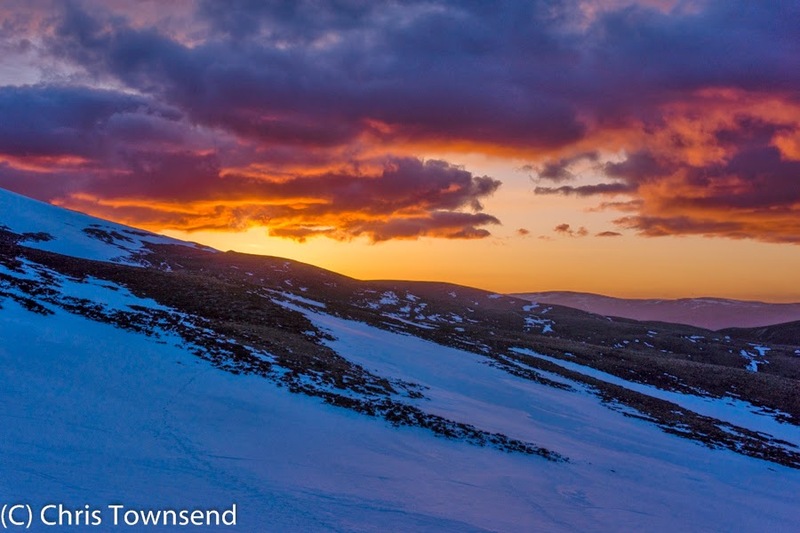 Having lingered to watch the last sunlight on the summits I made my way down to the car park as the clouds turned red and orange and the sky darkened to black. 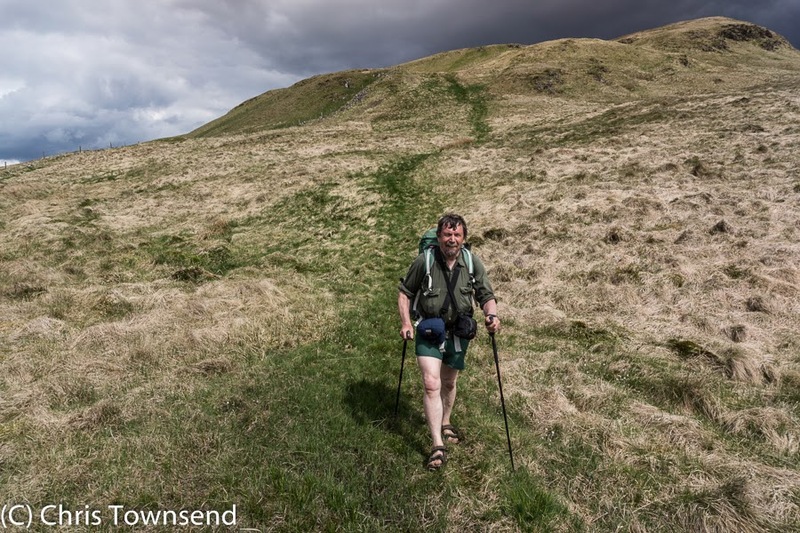 With people planning long walks for the coming spring and summer I thought it might be useful to post this piece on how the gear performed that I took on my 700 mile Scottish Watershed Walk last year. It first appeared in The Great Outdoors last autumn. A long walk is always a good way to see how gear performs and how well it lasts. 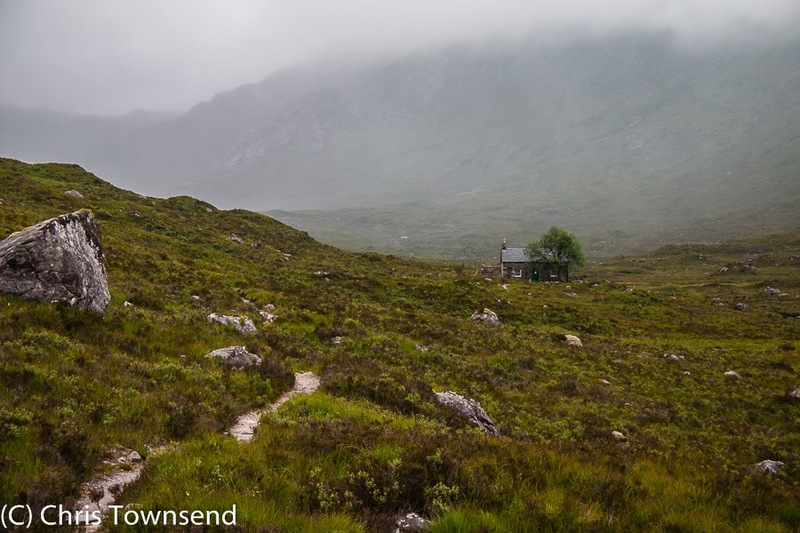 My Scottish Watershed walk last summer took 55 days and involved a huge variety of terrain – grassy hills, dense forests, heather moorland, muddy fields, rocky ridges and masses and masses of bogs. There’s no path most of the way so the going was often quite arduous. The weather was varied too. Overnight temperatures ranged from 2º to 15ºC. Only 13 nights were above 10ºC though. The driest, sunniest weather was near the start and at the end. Mostly it was cloudy and windy with rain on twenty days. The fine weather enjoyed by most of Britain didn’t often reach the Watershed. I walked 1200 kilometres. Map kilometres that is. Because of the lack of paths and the very rough nature of the terrain I reckon I probably actually walked half as much again. Overall my gear performed well and there’s not much I’d have changed. The weight of my load varied depending on how many days’ supplies I was carrying. 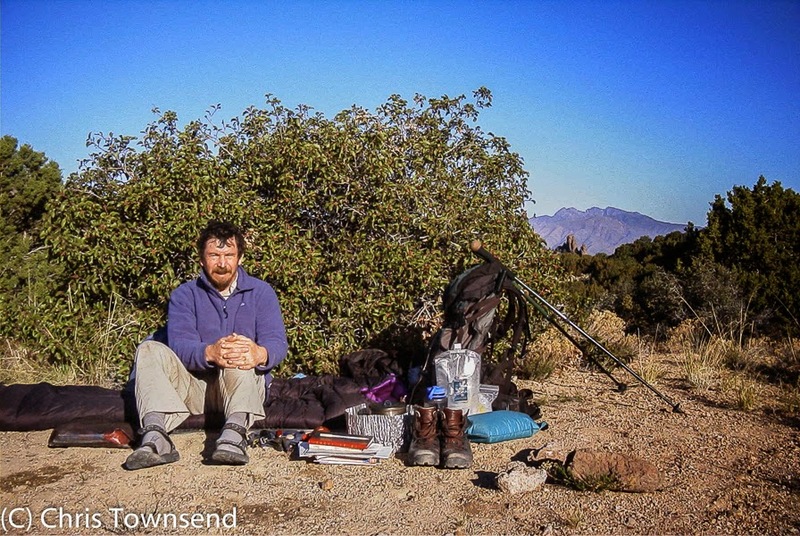 I set off with a week’s supplies several times and once with ten days worth. Some items weren’t carried for the whole trip. It mostly weighed between 12 and 18kg. I’ve liked Inov-8 Terroc trail shoes for many years and I’d worn them on other long distance walks so they were my choice. Inov-8 changed them this year though and I was interested to see if the new design would perform as well as the original one. If they didn’t I’d have had problems so I was relieved they turned out to be just as good. The latest version has solid rather than mesh uppers and is a little higher at the rear. The tongue is slightly wider and a little more padded too. The fit is the same – just wide enough for me at the forefoot while snug at the heel. The wind can’t blow through the uppers as it did in the mesh ones so the new style Terrocs are a bit warmer, which is good in cool weather but means they are hotter in the heat. They take slightly longer to dry as well. Durability is much better however. At the end of the walk the uppers were still in good condition – the mesh ones usually sprang holes after a few hundred miles. The sole has begun to wear down but there’s still some tread left. I hiked around 1000 kilometres in the Terrocs, wearing Hi-Tec Owaka sandals the rest of the time. These lightweight sandals were well worn when I began the walk and some of the straps had pulled away from the soles and the tread was almost flat by the time I finished. They were still wearable though. As well as on warm days I wore the sandals around camp and on rest days. My socks were Teko merino wool Minicrew ones that I wore most of the time and which had holes in by the end and Light Hiking ones that were kept for camp wear. The Minicrews could be worn for a week at a time whilst remaining comfortable even when soaked, as they often were. The Lightwave Ultrahike 60 pack was excellent. It always felt comfortable and I never had sore hips or shoulders. It was also stable, which was important when I was lurching about in bogs and dense tussocks or scrambling down steep, greasy slopes. It easily held all my gear. I added a length of shockcord to the front and used this to hold my thin foam pad. My water bottle and map went in the mesh side pockets. Everything else went inside except when my shelter was really wet, in which case I strapped it to the side of the pack. The Ultrahike is almost waterproof. However the seams attaching the back panel aren’t sealed and I did have some leakage here, though far less than in most packs. I still kept water sensitive gear in waterproof bags. Rather than a single pack liner I used several Exped Fold Drybags for sleeping bag and clothing plus Aquapac and Aloksak bags for items like maps, notebook and smartphone. 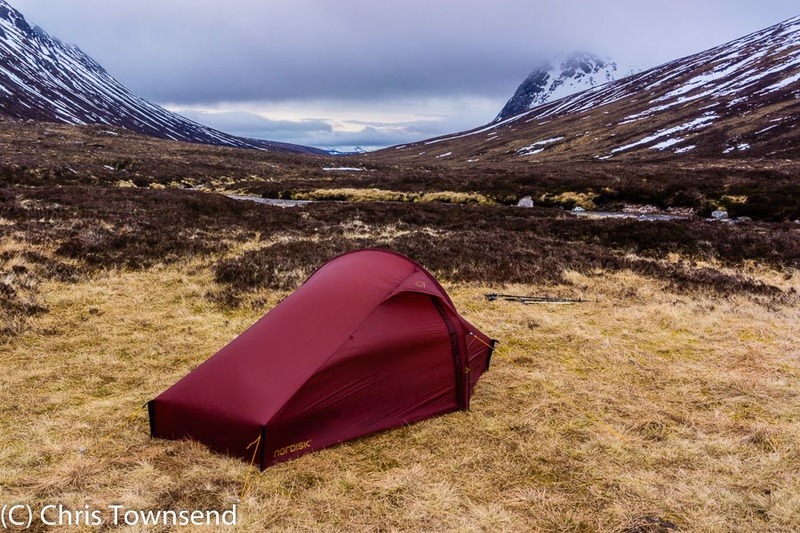 My shelter had to cope with some very stormy weather and some awkward bumpy pitches. 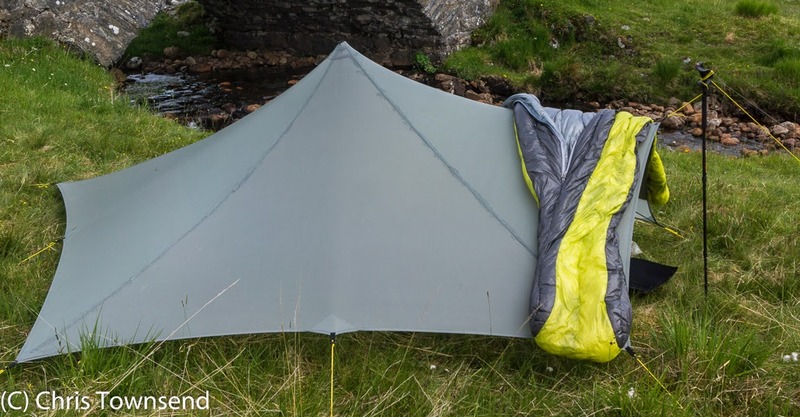 The Mountain Laurel Designs Trailstar did this very well. I love the versatile design which means it can be pitched just about anywhere. I pitched it high with masses of headroom when the wind wasn’t too strong and low with a ground-hugging profile in big storms. Just once I moved it during the night when a ferocious wind kept shaking it and I realised I wouldn’t get much sleep. Moving it just fifty metres downhill made all the difference. As it was midnight and the rain was hammering down I was glad I could pitch it very quickly. 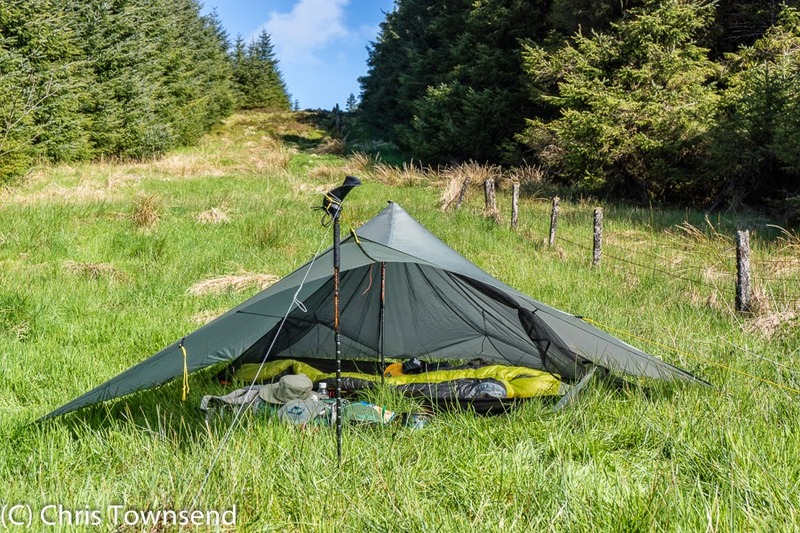 The Trailstar does not come with a groundsheet or inner so I also took an Oookworks Trailstar Nest, which is a mesh inner tent with sewn-in groundsheet, to keep off the inevitable midges. The Nest was a little fiddly to pitch until I realised I could tie the shockcords to the Trailstar and pitch the two together as a unit. There was enough room for me to sit up in the Nest and store some gear. The complete weight of the Trailstar and Nest and pegs was 1157 grams. Both items showed little signs of wear at the end of the walk. 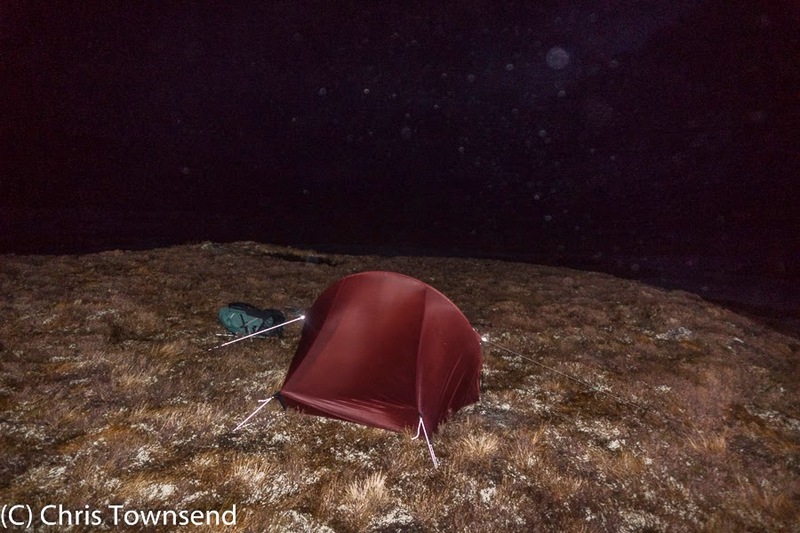 I used my Carbon Fibre Pacerpoles as poles for the Trailstar. These were the same ones I’d used on the Pacific Northwest Trail when they also acted as tent poles. They are still in good condition. I’m a warm sleeper so I reckoned the 650 gram Rab Infinity 300 sleeping bag, which has a comfort rating of +3ºC, would be more than adequate. And so it proved with the bag keeping me very warm on the coldest +2ºC nights. It was also very comfortable. Once the temperature was much above +10ºC it was a little too warm however and I slept with the half length zip undone and the bag draped over me. For insulation and comfort I took a NeoAir XLite Small airbed, which weighs 230 grams and packs up really small. It lasted the whole trip okay and was quite comfortable as long as I didn’t inflate it too hard. It was just big enough for me – any narrower and it would have been uncomfortable. I also carried a thin foam OMM Duomat. This 135 gram mat was used under my feet when sleeping and as a sitmat during the day and in the Trailstar. It was well worth the weight. Stove choice was partly determined by the likelihood of finding fuel supplies along the way. I was tempted by the simplicity and speed of a gas stove but thought I might not find cartridges everywhere, as turned out to be the case. I didn’t find cartridges anywhere in the Central Belt, not even in Cumbernauld, the only town on the Watershed. I did find meths everywhere, which justified my choice of the 225 gram Caldera Ti-Tri Inferno. This stove works really well in windy weather and is quite fuel efficient. I carried the Inferno insert so I could also burn wood in it but in fact I only did this twice due to the stormy weather and, in many places, lack of fuel. In case I couldn’t find meths I also carried the tiny 3 gram Gram Cracker stand for solid fuel tablets and half a dozen of the latter. I eventually used these during the last 11 day section of the walk when I ran low on meths. 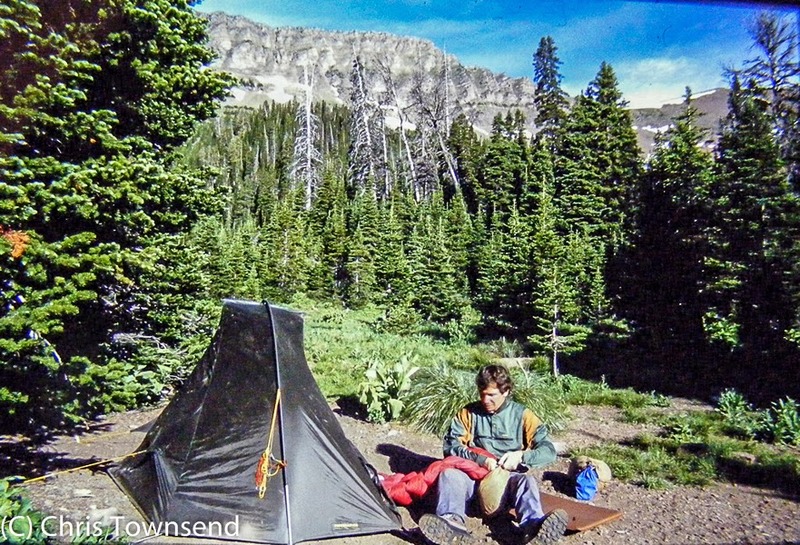 The Ti-Tri was the same one I’d used on the Pacific Northwest Trail so I knew it worked well and was durable. My pots were the oldest items I had on the walk. My Evernew 0.9 litre Titanium one is 22 years old and a veteran of many long walks. The MSR 0.6 litre Titanium pot that nests inside it and doubles as a mug is quite young by comparison at just 12 years. Both pots are still in excellent condition. 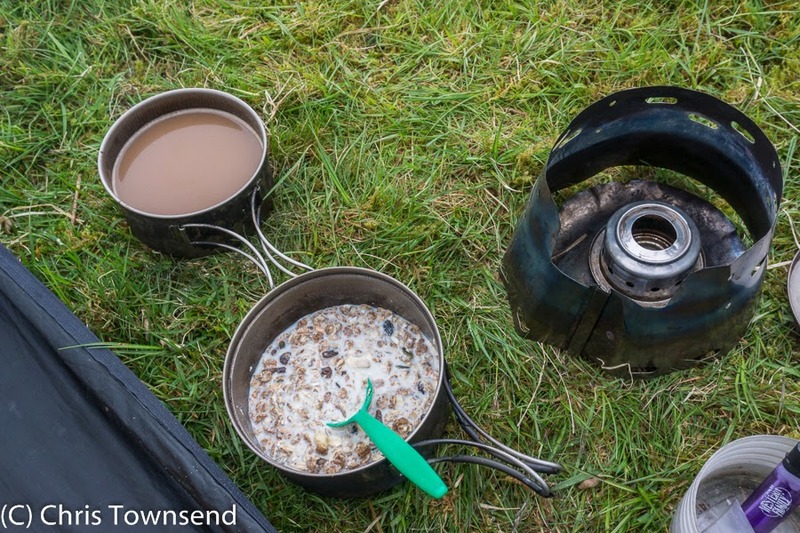 Other kitchen stuff consisted of a Sea to Summit alloy spoon and an Outdoors Grub Long Strong Spoon. I like two spoons as they are easily lost, bent or broken. For water I had 1.5 and 2 litre Platypus bottles and a 700 ml hard-sided GoLite bottle, which was used to carry water during the day. In the rain, which was more prevalent than I’d have liked, I wore a 430 gram Rab Myriad Neoshell jacket, which performed really well and was less clammy and more comfortable than many waterproofs though I did get a little damp in it at times. But then conditions were sometimes such – heavy rain, wet cloud, strong winds – that I doubt I could have stayed dry in anything. I often didn’t bother with overtrousers as my walking trousers were reasonably warm when wet and dried quickly. When I did need them I wore an old pair of GoLite Shadow Pants, made from Gore-tex Paclite and weighing 222 grams, which had zips just long enough that I could pull them on over my shoes. These overtrousers worked okay and I never had much condensation in them. Any fully waterproof fabric restricts breathability to some extent, even Neoshell. In dry windy weather I find a simple windproof top more comfortable so I took the 170 gram Montane Lite-Speed jacket, which is made from Pertex Microlight and which has a hood and a mapsize chest pocket. The Lite-Speed repelled light showers and was comfortable worn under the Myriad jacket. For warmth I took my old well-used Jack Wolfskin Gecko microfleece top, which weighs 215 grams and has been on many walks over the years. It’s a little thinner than when new but still provides all the warmth I need most of the time in the summer. I wore it in camp every day but only occasionally while walking. With a forecast for unseasonal cold weather at the start of the walk I decided to take another warm garment for at least the first few weeks. Which one was decided a few days before I set off when a new ultralight down top arrived for test from PHD. The Wafer Jacket weighs just 189 grams and compresses into a tiny bundle. It was delightful to wear in camp on chilly evenings and made a reasonable pillow. I ended up carrying it the whole way, though I didn’t wear it much during the last month. On my legs I mostly wore Paramo Merapi Active Trousers, which are soft, comfortable and windproof. They worked well and stood up surprisingly well to some rough treatment, especially in dense forests. In hot weather I wore an old pair of GoLite shorts, which had an inner brief and so doubled as underwear. 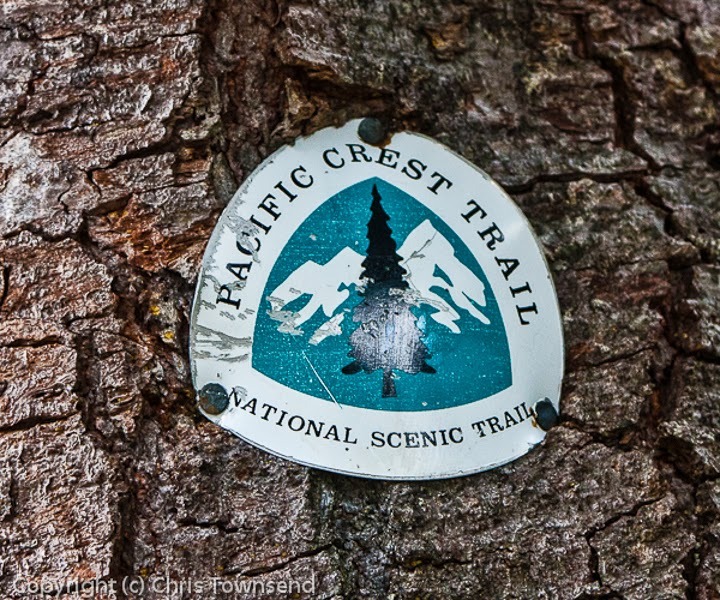 On my torso I used the same garments that had performed well on the Pacific Northwest Trail – a Paramo Katmai Light shirt most of the time and an Icebreaker merino wool T-shirt in the coolest, wettest weather. I didn’t bother with gloves but I did have a Smartwool Beanie for cool weather, and was glad of it. For the sun I started out with a Tilley Hat but accidentally left this behind in Moffat (I got it back eventually). I replaced it with a cotton cap that cost me £5 in Tesco’s in Cumbernauld and which proved surprisingly comfortable and hard wearing. For navigating, which was difficult in places as the Watershed is not always clear, I had 1:50,000 OS maps with the Watershed marked on them, a Silva Type 3 compass and an HTC Desire S smartphone and Nexus 7 tablet, which both have GPS. I had ViewRanger software and OS maps on both devices. As on previous trips I found the easiest way to navigate in poor visibility was to locate my position on the GPS map and then use my compass and paper map. I didn’t need both phone and tablet for navigating of course but each had other functions as well. I carried spare batteries for the phone plus a charger for phone and tablet that I used at town stops. In case of emergency and to keep people informed as to my progress I carried a SPOT GPS Messenger for the first time. I sent back location messages most days and everyone got through so I am quite happy with the device. Other items consisted of a Petzl XP headlamp, small first aid/repair kit, basic wash kit, Kindle e-reader, notebook and pens, dark glasses, reading glasses, mini binoculars, cotton bandanna, watch, Swiss Army Knife and a Kestrel 4500 Weather Station. My camera gear consisted of Sony NEX 7 and NEX 6 cameras with Sony E 16-50 and 10-18mm lenses, carried in Lowe Pro and CCS padded cases, plus spare batteries and memory cards and a Velbon V-Pod ultralight tripod. Finally. High pressure. After a winter of storm following storm the air stilled and the sun shone. The storms have been both positive and negative for mountain lovers. 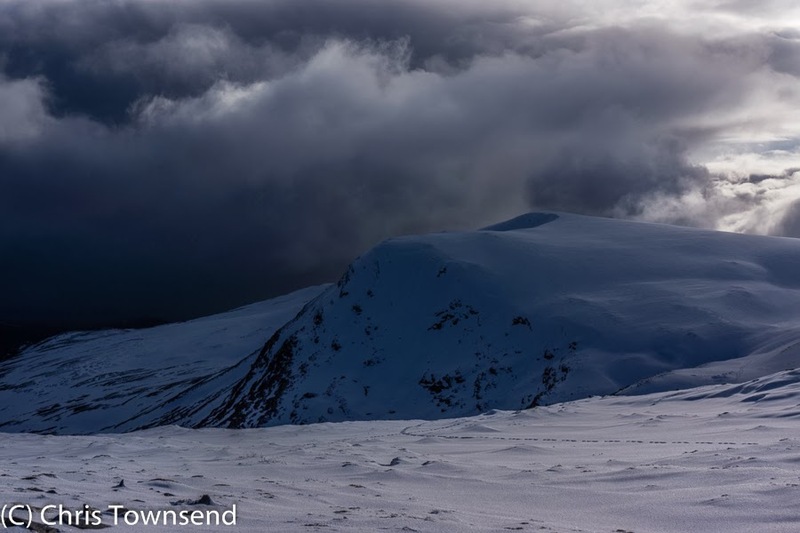 Positive in that masses of snow has been dumped on the Scottish mountains, far more than in other winters, but negative in that high winds and low cloud have made it both difficult and hazardous to actually enjoy the snow. Now that seemed possible so I decided on the first real backpacking trip of the year - by which I mean a trip on which I moved on each day rather than setting up a base camp for a few nights. Not having been right through the Lairig Ghru pass that splits the heart of the Cairngorms for some time and knowing that it is particularly magnificent when under snow I decided to go that way and then curve round the high mountains and return via the more easterly pass of the Lairig an Laoigh. 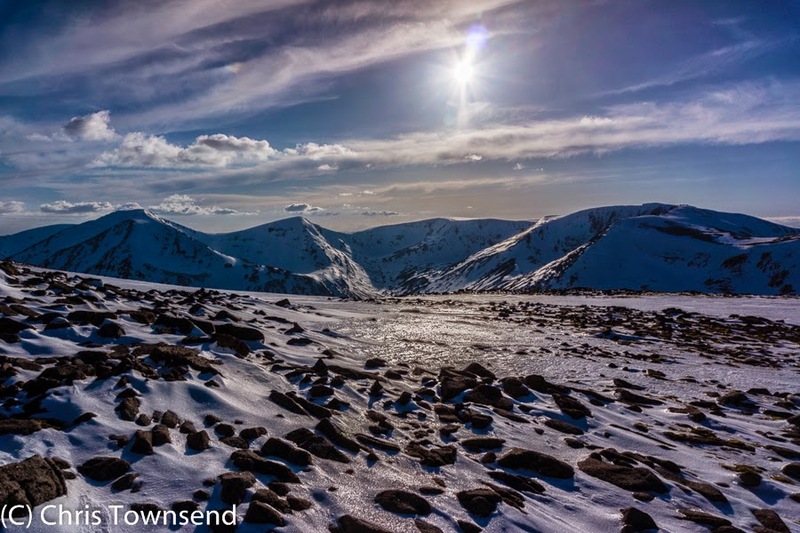 I set out one afternoon, in good spirits after a fruitful morning meeting, to cross below the great snow-covered Northern Corries of Cairn Gorm, which shone in the bright sunshine, and cut through the rocky snow-stuffed notch of the Chalamain Gap to the Lairig Ghru. The air was hot and still. Sunscreen was important and I rolled up the sleeves of my thin shirt and wore a sunhat. 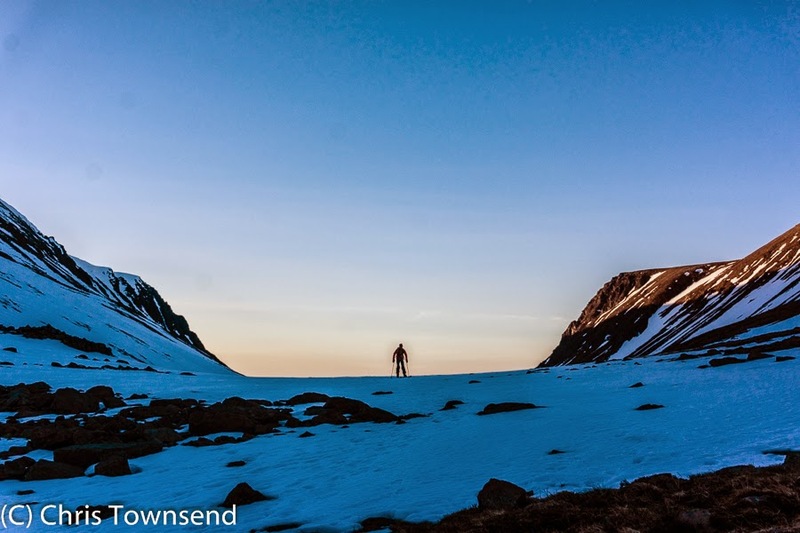 As I climbed slowly into the long heart of the Lairig Ghru the sun dropped behind a ridge and I was in shadow. The effort of the ascent kept me warm. Snow patches appeared, soft and treacherous, collapsing under my boots. Gradually the snow grew more extensive and harder and soon I was walking on a firm, crunchy surface that filled the cleft of the pass. To the east the walls were rocky with only a few snow patches. Here the sun had done its work. Indeed, the rocks still glowed with its light. To the east there was much more snow and the shadowed rocks were grey and cold. 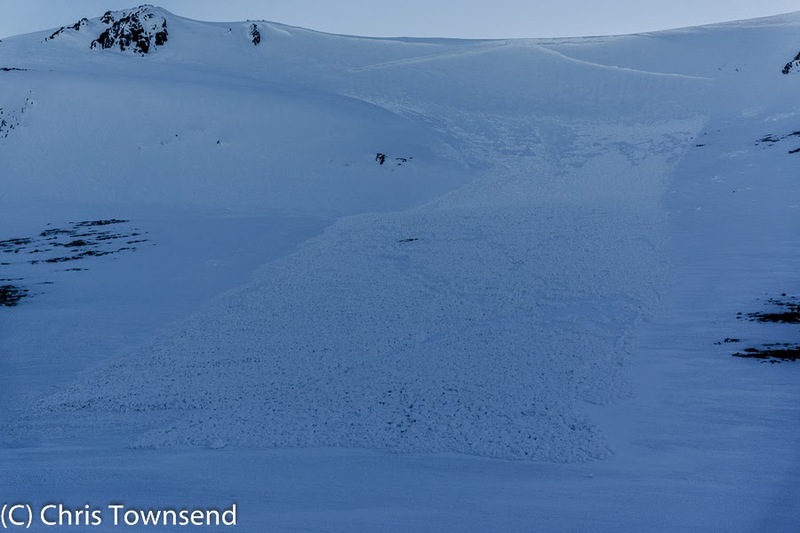 Several avalanches had crashed down from the cornices high above, some almost reaching the bottom of the pass. Around them dozens of dark rocks lay embedded in the snow, missiles hurled down from above. I kept well to the eastern side. Who knew where the next avalanche would stop? Two skiers climbed towards me, their skis over their shoulders. 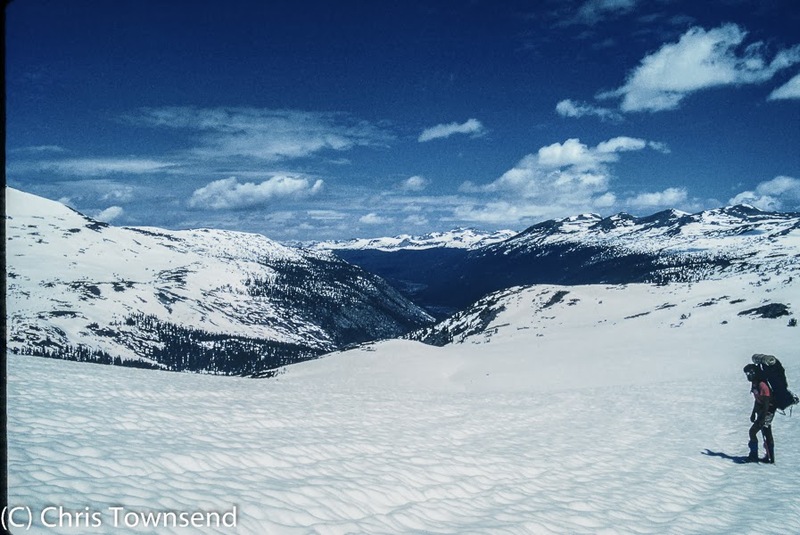 On reaching flat snow they changed from awkward lumbering walkers to graceful skiers and sped away over the pass. They were the second skiers I'd seen. The first were also carrying their skis. I'd considered bringing mine. I was glad I hadn't. I'd have spent too much time carrying them. And the snow was mostly fine for walking. Once through the highest part of pass I could see the peaks to the south, their summits still catching the sun. 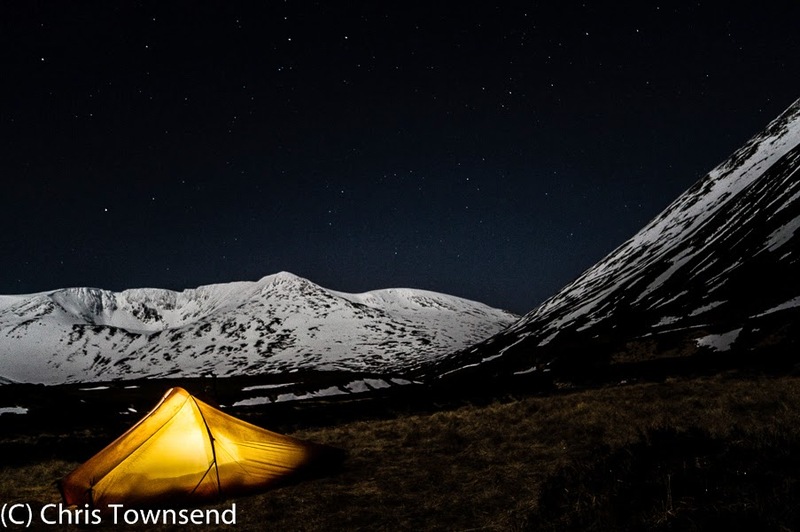 I descended until below the snowline then found a dryish, reasonably flat pitch for the tent. 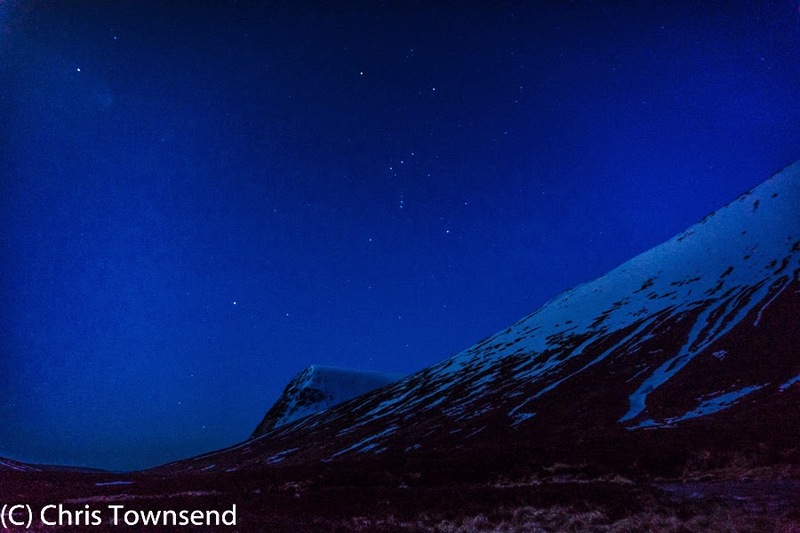 A bright nearly-full moon rose over the shoulder of Ben Macdui, its pale radiance sweeping the ground and making the snow high above glow with a faint and eerie light. A frost quickly coated the tent. Stars appeared. There was not a breath of wind. A perfect night in the mountains. It was not to last. I fell asleep with the doors open, still staring at the sky and the snow and the mountains. The temperature was -2ºC. A cool wind on my face woke me. The tent was flapping lightly. I looked at my watch. 2 a.m. I zipped the tent shut. An hour later I woke again, feeling hot. The temperature was +6ºC. I looked out. The frost was gone. So were the stars and the tops of the mountains. Grey cloud covered the sky. The following day the clouds remained, mostly. Occasionally the sun almost broke through. Occasionally the clouds faded and scattered, revealing patches of blue sky. But the greyness always swept back in. This meant a day for other joys than mountain watching and revelling in big landscapes. 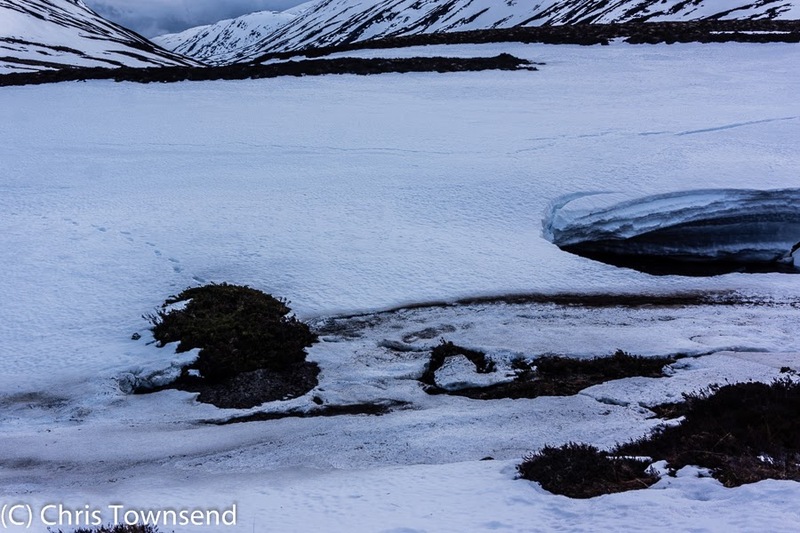 The air was warm and the lower snow thawing which made for many attractive streams and rivulets speeding down rocky chasms and spilling over onto the grass. In Glen Luibeg and Glen Derry I admired the ancient and magnificent Caledonian Pines and was heartened by the extent of regeneration with young little trees everywhere. As I neared the end of the trees in Glen Derry a blackcock with its distinctive black and white plumage sailed in front of me and perched right on the top of one of the bigger pines, the tip of the tree swaying under its weight. Then it was off again, flying low and fast down the glen. Later in the day as I was passing the still mostly-frozen Dubh Lochan pools a large dark bird flew towards me. A golden eagle! It flapped past, seemingly ponderous as it made its way low along the hillside against the wind. 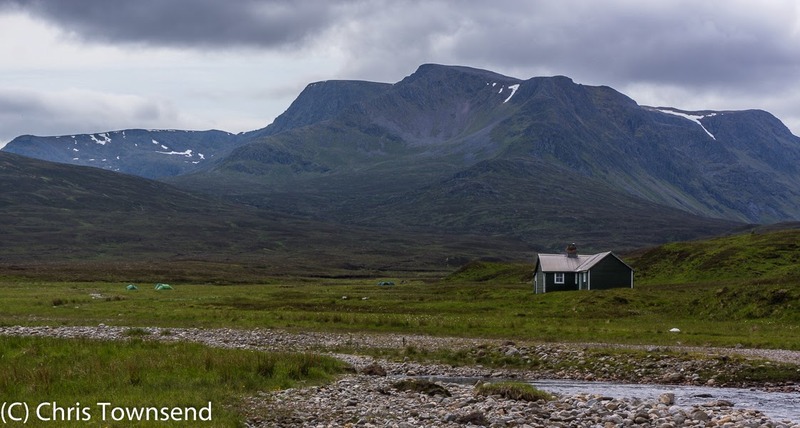 Then it reached a broad snowfield that stretched from the glen right to the top of the hill. Here the eagle began to spiral upwards, slow and graceful. Each turn seemed to gain little height yet gradually it rose, soon reaching the edge of the mountain. On into continued high into the sky, way above the snow, still turning and turning, with barely a flap of its wings. I felt as though I could still see the track of its flight stretching out below it. Then when it was as high above the mountain as the mountain was above the glen it made a final turn and flew fast and straight into the dark clouds away to the west. 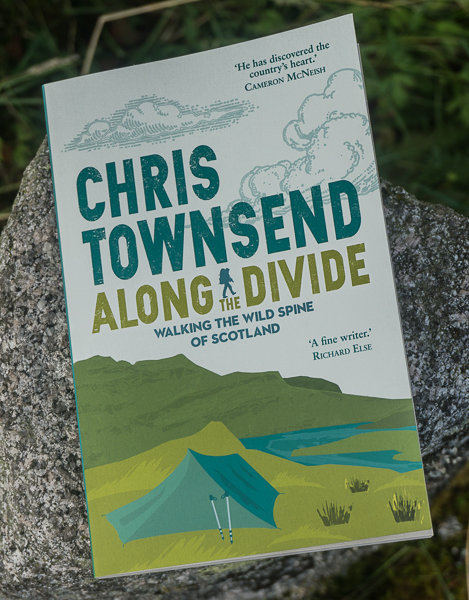 Eventually I could see it no more and it was time to move again and continue what seemed my even more slow and clumsy progress through the bogs and snowfields. What must it be like to soar like that, in control of the wind and the sky, to cover in minutes what would take me hours and seemingly without effort. Despite the snow, the sodden muddy ground and various stream fords I'd managed to keep my feet dry until I came to the Glas Allt Mor, a raging snow-melt torrent. This time I could see no boulders to use as stepping stones, not even ones just below the water. Finding a wide section that didn't look too fierce I waded. The water was knee-deep and cold. Striding uphill afterwards soon warmed up my feet. I hadn't even thought about this stream. My concern was with the River Avon, which I wanted to ford but which I knew might be in spate and too dangerous to cross. 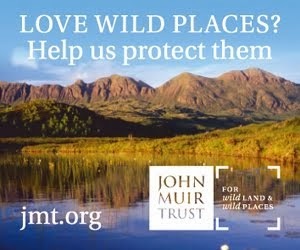 That would mean a long walk upstream and along Loch Avon and then fords of the feeder streams of the latter. However when I reached the Fords of Avon the river was still mostly snow-covered, though there were several holes where the river rushed into caverns under the snow and the snowfields were cracked and sagging. I picked a spot in the middle of a long snow bridge and crossed gingerly, trying to put as little weight on each step as possible whilst still moving fast. The snow held. Unless there is a freeze soon the river will become impassable for a while though. 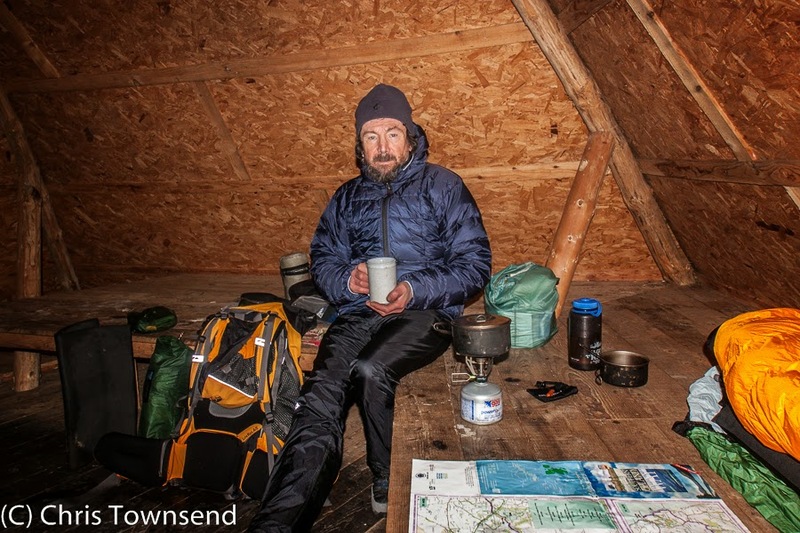 A few kilometres beyond the Avon I stopped to camp as it was dusk and a climb came next. The top of a low knoll provided a dry spot. There was no wind. I was asleep early, which was good as again the weather changed abruptly overnight. Rain spattering on the tent woke me at 2 a.m. Then at 4 a.m. great rushing gusts of wind shook the tent. I soon realised I would get no more sleep so I dressed, managed to carefully make a hot drink, ate an energy bar and packed up. Often when exiting a tent the weather outside doesn't seem quite so bad. Not this time. I climbed out into a big storm with lashing rain and a wind that nearly knocked me over. The wind continued all day. (An 111mph gust was recorded by the Cairngorm Weather Station). I set off in the dark, my headlamp picking out the rough path. Crossing the shoulder of Bynack More at 800 metres I was twice blown uphill whilst traversing snowfields. Without my trekking poles I'd have been blown over several times. Starting the descent was a relief, as was reaching the first trees and the shelter of Glenmore Forest, though even here the wind was strong and raucous. The walk finished at 9 a.m., a little earlier than intended, by which time I'd walked 10 miles. My car, in a wooded car park, was rocking in the wind. The change in the weather had made the trip more strenuous and more of an adventure than I'd expected. But it had been deeply enjoyable and there is much I'll remember for a long, long time. In the Superstition Mountains on the Arizona Trail. This piece was written as the introduction for a review of fleece and soft shell jackets in The Great Outdoors several years ago. I was asked recently why I still wore fleece. I think this answers that question. Just about every outdoor clothing company makes a range of bright coloured fleece and soft shell clothing and racks of the stuff can be found in every outdoor shop. Look beyond the colours and brand names though and most garments are surprisingly similar with designs dominated by zip-fronted jackets with two lower pockets. This simple design is okay for casual use but not the best for hill walking and backpacking, especially for soft shell. 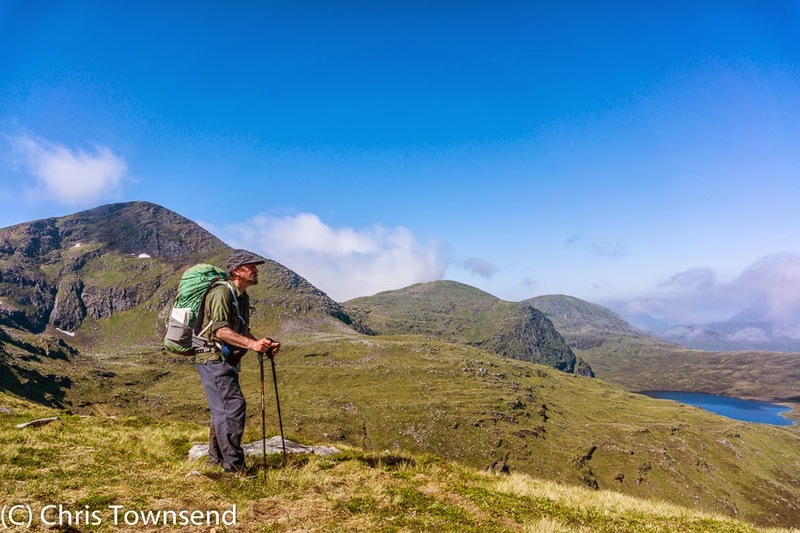 In this feature I’m going to consider the most functional designs and materials for both fleece and soft shell and look at which is best for the hill rather than the high street. Whilst some fabrics are clearly fleece and some clearly soft shell others are a mix of both so there is no absolute distinction. At what point does a windproof soft shell become a windproof fleece? What about garments with a brushed fleece inner and a smooth soft shell outer? The basic difference is that fleece is designed to provide warmth not weather protection while soft shell is designed to provide weather protection before warmth. Fleece is only wind or water resistant if a second material – an inner membrane or outer tightly woven shell – is added. Soft shell is wind and water resistant by design. With both fabrics insulation is determined by thickness. Generally fleece is lighter in weight for the same warmth. The warmest soft shells usually have fleece inners, which makes for a fairly heavy and bulky combination. Fleece is very much a mid layer, designed to be worn under wind and waterproof shells while soft shell, as the name suggests, is designed to cope with at least some wind and rain on its own. Fleece comes in different weights (thicknesses). The basic ones are often labelled 100, 200 and 300 after a system devised by Polartec. I think 100 weight fleece, which is the thinnest and lightest, is the most versatile for hill walking as it can be used year round. In summer I carry it as my main warmwear. In winter I often wear it while walking and carry a second warm layer. The heavier fleeces tend to be too warm in summer though people who feel the cold often like them for autumn to spring wear. However 200 and 300 weight fleece and similar are quite bulky and heavy. I’d rather carry two 100 weight fleeces. Because fleece isn’t windproof it’s very breathable. Condensation inside a fleece is very unusual. Combined with the softness of the fabric this makes fleece very comfortable to wear. However in anything but a light breeze a windproof shell garment is needed. Lightweight windproofs are ideal for this, except in heavy rain, as they are also very breathable. The combination of a light windproof and a light fleece is more breathable than windproof fleece, which is made of two layers of fleece with a windproof membrane sandwiched between them, and usually lighter in weight as well. I think windproof fleece is great for casual use but isn’t versatile or breathable enough for the hills. I can get sweaty very quickly inside a windproof fleece. You can’t separate the layers and just wear one of them as with a fleece and windproof combination either. Whilst the definition of soft shell is debatable most companies now use it to mean a stretchy fabric that is wind and water resistant and that’s how I’ve used it here. Soft shell garments can be worn as the outer layer much of the time, if the design allows. The last is an important point as many soft shells don’t have the features needed for an outer garment, particularly a hood. Soft shells that rely on a tightly woven structure to repel the weather are not as wind or water resistant as ones with a membrane. Such woven soft shells are quite breathable but also much heavier than fleece for the same warmth whilst still needing a shell in strong winds and rain. They are also slow drying and bulky to pack. I don’t really see the point of these fabrics for jackets (trousers are a different matter) as the performance doesn’t compare with a fleece and windproof shell combination. Soft shell with a membrane is better as it will cope with all but the heaviest rain and strongest winds, meaning that only a very light waterproof need be carried. 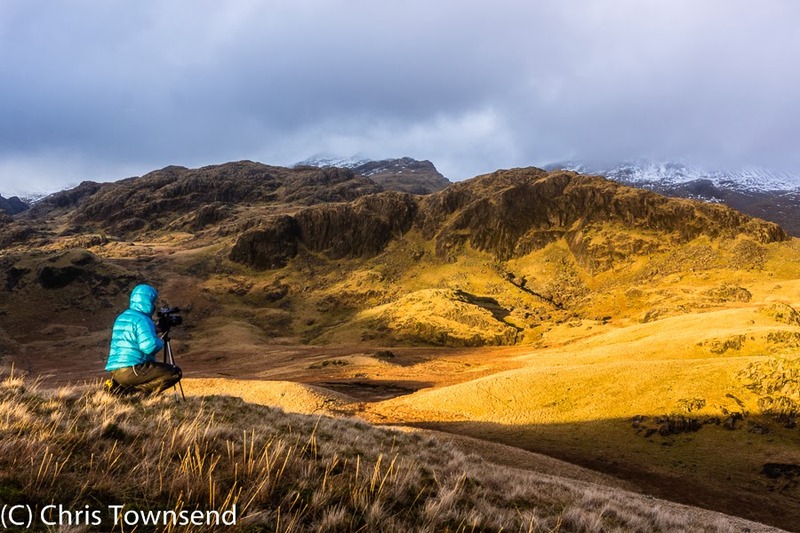 Even so the weight and bulk of soft shell and the lack of versatility over separate fleece and windproof garments means I only use soft shell jackets on day walks or overnight trips. Of the different soft shells with membranes I’ve found Polartec Power Shield the most breathable as well as being windproof and almost waterproof. The better breathability than other membranes is due to the membrane which is 98% not 100% windproof. Polartec says the remaining 2% allows air to circulate, increasing breathability. It’s not perfect of course and I have got quite sweaty in a Power Shield jacket during long climbs. 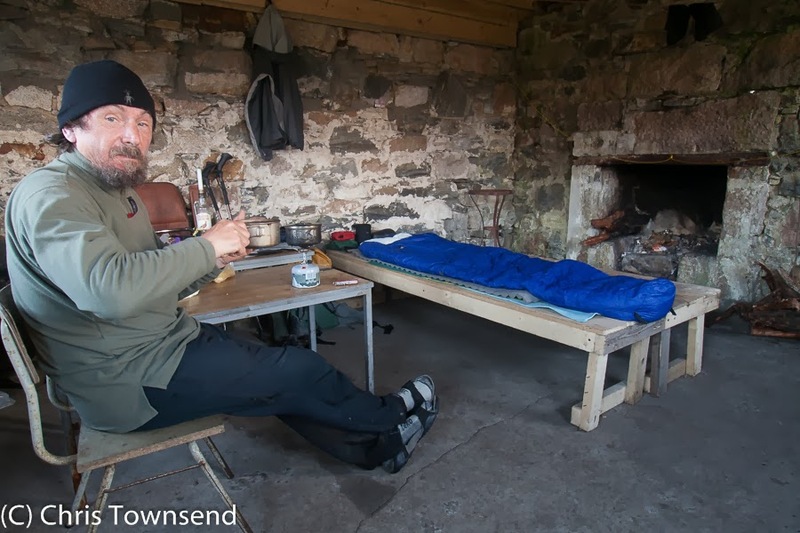 Fleece top for warmth in a bothy. As I’ve indicated most soft shell jackets have poor designs for outdoor use. Makers seem to have forgotten the word “shell” in “soft shell” and gone for standard fleece jacket designs. Few soft shell garments have hoods, which are essential in my view, or front zips and pockets designed to resist rain. If you need to wear a wind or waterproof shell on top of a soft shell in anything more than light rain or a breeze then you’d be better off with a fleece. To be suitable for the hills a soft shell should have an adjustable hood, large pockets accessible when wearing a hipbelt and water resistant closures. The best designs for fleece are the opposite. In storms fleece is worn under shell garments so big pockets and water resistant zips are unnecessary. A hood can be useful, and can replace a warm hat, but isn’t essential. In fact my favourite fleece is a pullover design with no pockets and only a short zip. It’s very light though and performs perfectly as warmwear, which is all I want. 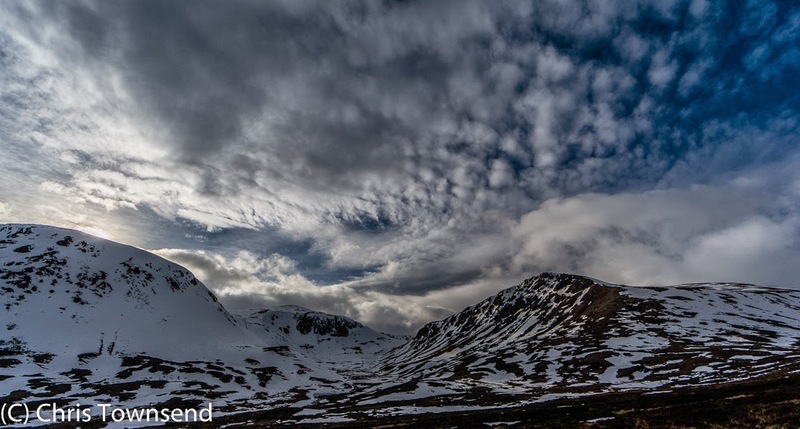 The Monadh Liath - the grey hills - are often regarded as rather bland and uninteresting, especially when compared with the Cairngorms (original name Am Monadh Ruadh - the red hills) just across Strathspey. However the rolling hills of the Monadh Liath have attractions of their own, especially for those who love feelings of space and vastness. Here the horizons are distant and the high country rolls on seemingly forever beneath huge skies. 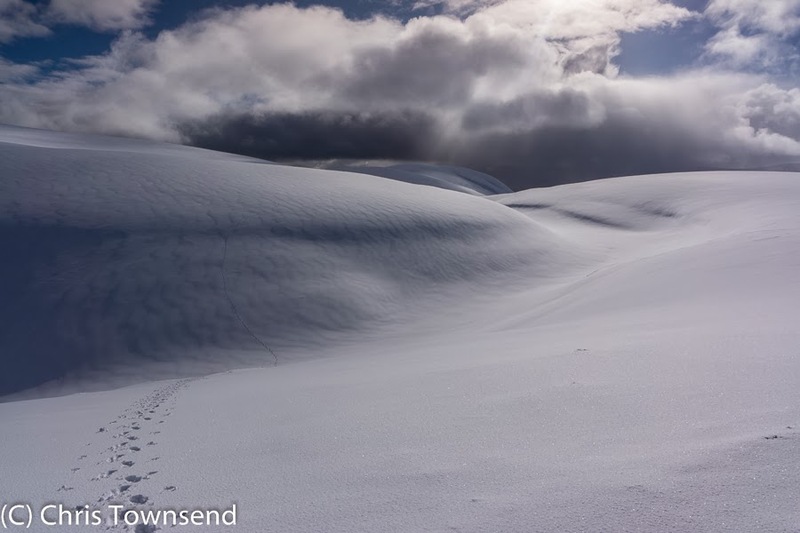 Under snow the Monadh Liath can be especially magical as I found today on my first winter venture into these hills for several years. I'd gone to the Monadh Liath as the forecast suggested the summits might be clear and there could even be some sunshine whilst the Cairngorms to the east remained in thick fog. The forecasters were correct. All day a dark boiling mass of cloud covered the Cairngorms while in the Monadh Liath the sun shone and the sky was a deep blue with only occasional squalls darkening the air. I climbed two of the four highest summits - A'Chailleach and Carn Sgulain - but the Monadh Liath are not really about peaks (the second of these two is just a gentle rise above the surrounding moorland) but about the whole high level area. 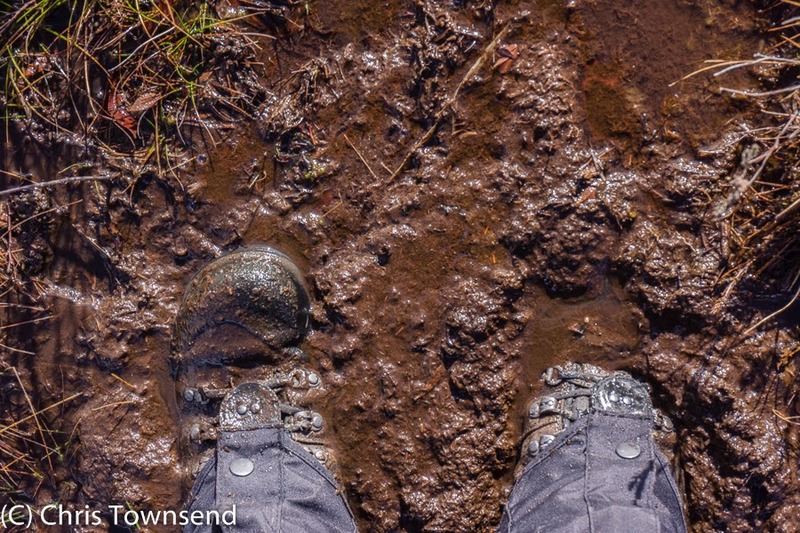 Low down I ploughed through sodden heather and grass on slippery, muddy paths. Then came the first snow, soft, deep and unsupportive. Gaining height was hard work. But once I reached the higher snowfields the world changed. Here the snow was firm, crunching under my boots. Firm and smooth. Instead of the wind-blasted rutted snow-ice and deep drifts I've grown used to in the Cairngorms this winter here was a soft blanket spread evenly over the land in gentle folds and drapes. 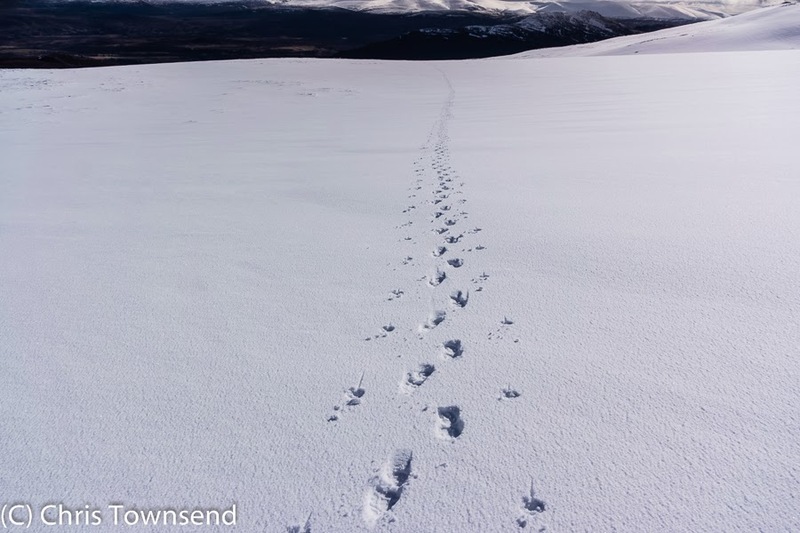 The only marks were the long tracks of mountain hares (I saw several) and the occasional tuft of grass or tip of a boulder. Then there was the light. And what light! The sun shining through the clouds lit up the shape and texture of the snow. The land was white and blue, shining and shadowed, reflecting the blue sky and the bright sunshine and dancing with cloud patterns. The white world stretched out to infinity. There was nothing but snow and sky, forever and forever. Or so it seemed. Coming down to the dark glen and the bogs and mud my head was still full of the shining world high above. The Monadh Liath had given me the best day of the winter so far. Back in 1999 The Great Outdoors magazine celebrated it's 21st birthday. For the anniversary issue I wrote a feature about changes in gear during those years. I came across this piece recently and, with some updates to take account of another 15 years, here it is. Aah, the good old days! Gear was gear then, none of this soft fluffy stuff. And it was lighter, and tougher. So goes the ageing walker, sitting in the corner of the bar smelling slightly of dead sheep and mildewed cotton. But what gear were walkers using in 1978? And was it as good as the stuff we use now? A quick flip through the pages of the first issue of The Great Outdoors reveals advertisements for leather boots with stitched soles, non-breathable cagoules (lots of those), fibre-pile jackets, external frame packs, ridge tents, tartan wool shirts and cotton windproofs. There are ads for Gore-Tex and internal frame packs but fleece, lightweight boots, trail shoes, dome and tunnel tents, trekking poles, GPS and much more are strangely absent. I'm surprised though at how many of the brand names are familiar - Vango, Mountain Equipment, Rohan, Karrimor, Berghaus, Field & Trek, Primus, Optimus, Camping Gaz, Nikwax, Gore-Tex, Zamberlan, Sprayway - but who now remembers Pointfive, Boylans, Daimor, Bukta, Camp Trails, Hawkins, Munari, Ultimate? Gear was a major feature of the first issue of The Great Outdoors with seven pages devoted to a review of the 1977 Camping Trades Association Exhibition (CTA is now the Outdoors Industry Association), a page of test reports (a waterproof cagoule from Clarks (!) and a polyester filled proofed cotton jacket from Tenson), two pages of thoughts on lightweight camping by Robin Adshead (showing the lightweight approach was in The Great Outdoors from the start), another two pages on choosing backpacking gear at the age of fifty by Andrew Harper and a Meet the Retailer page on The Great Outdoors (of course! ), in Yeadon. That's 13 pages in all, a significant chunk of a magazine with just 32 pages of editorial. Here I've taken a dash through the past; seeking out those items that have lasted and looking at the changes that have taken place. What we put on our feet has changed amazingly. In 1978 the "lightweight revolution", as it was called, was still a few years away and boots were generally fairly stiff and heavy and always made from leather. I walked from Land's End to John O'Groats in the spring of 1978 wearing 5 lb leather boots with metal shanks in the soles, something I shudder at now. The first signs of change came in 1980 with the launch of Karrimor's K-SBs (then made by Asolo) with fabric/suede uppers and a lightweight flexible synthetic midsole instead of a stiff leather one. TGO editor Roger Smith wrote in his review of the 1980 COLA Show that "1981 could be the year when the lightweight walking boot really makes the breakthrough". He was right and this was reinforced the next year, 1982, with the launch of the first Brasher Boot and the Scarpa Bionic range. In that year I became committed to the new footwear after starting my 2,600 mile Pacific Crest Trail walk in 5 lb stiff leather monsters and finishing in 1.5 lb fabric Asolo approach shoes, the forerunners of today's trail shoes. Then as now some people felt lightweight footwear was unsuitable for serious use. In a feature in the February 1993 TGO I wrote "after 1200 miles, with a 60-70 lb pack, I beg to differ". After many, many more miles with many more loads I still do. Although improvements continue modern walking boots and shoes are still based on the designs launched in the early 1980s. The only really new development in the 1990s has been sports sandals, which first appeared in Britain at the 1992 COLA Show and which were first reviewed, very positively, in the September 1993 issue by Cameron McNeish. However the 1990s did see an important breakthrough in the boot fitting system developed by Phil Oren and the use of Superfeet and similar supportive footbeds. If there is one product that symbolises the difference between 1978 and now it is Gore-Tex. Waterproofs then were made from non-breathable neoprene or polyurethane coated nylon. After a day wearing one of these the inside would be running with condensation. When The Great Outdoors was brand new so was Gore-Tex. 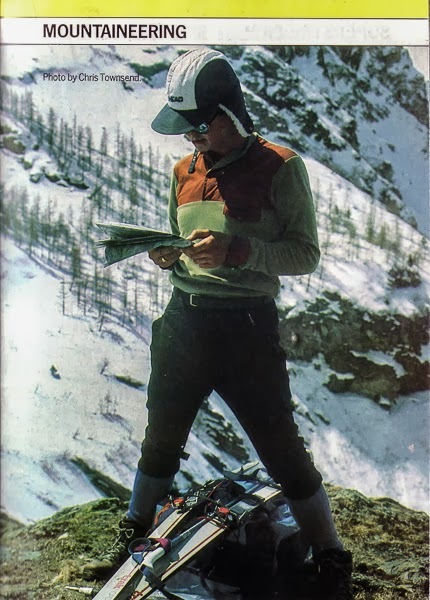 In the first issue Robin Adshead (a leading backpacking writer at the time and author of Backpacking In Britain, which I still have) reported on the 1977 COLA Show at which Gore-Tex was launched with garments from Berghaus and Mountain Equipment. Robin wrote that Gore-Tex "works well on some people in some weather conditions " (with which many would still agree) and said of the Mountain Equipment Cascade jacket that it was "not cheap at £38.50 but if Gore-Tex works, it is well worth the money". By the June issue he was "totally satisfied that Gore-Tex has great advantages over less porous waterproof materials". I was convinced too, having worn a Berghaus Mistral Gore-Tex jacket on my Land's End to John O'Groats walk and been amazed at how dry I stayed inside it. Gore-Tex didn't sweep non-breathables away immediately though. There were durability problems with first generation Gore-Tex and it was expensive (second generation was much longer lasting but less breathable and no less expensive). Slowly though the idea that wearing waterproofs didn't have to mean soaking in your own sweat became accepted. Competition is always a sign of success and in 1983 the first alternative to Gore-Tex, Entrant, was launched. This was soon followed by others, including Sympatex (called Syntatex in TGO!) in 1986 and Paramo in 1989, and by the end of the decade waterproof/breathable fabrics were the norm. The other great change was the rise of fleece, a name unheard of in 1978 other than on the backs of sheep, which is ironic in that fleece just about saw the demise of wool shirts and sweaters for most walkers. The change began in 1982 with the launch of Mountain Equipment's Thermofleece, followed soon afterwards by Ultimate Equipment's Polapelt. Ultrafleece, still in my opinion one of the best fleece fabrics, appeared in 1984 as did Patagonia's Bunting, which turned into Synchilla a year later. (To be accurate Patagonia had started the fleece revolution some years earlier in the USA but hadn't been available here before). Then 1986 saw the first Malden Mills Polarplus (now Polartec) garments from Berghaus and The North Face and the place of fleece in outdoor wardrobes was assured. Before fleece there was fibre-pile, a somewhat shaggy, scruffy fabric, though with a better warmth to weight ratio, and after fleece there is still fibre-pile. Indeed the latest fluffy fleeces look more like pile, as it became shortened to, than previous fleece fabrics. Some people never abandoned pile however and paralleling the rise of fleece was the rise of Buffalo with its Pertex/pile garments which were first launched in 1986 and which is still going. 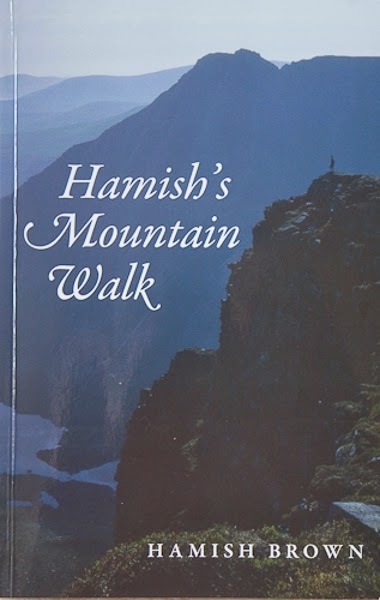 The man behind Buffalo, Hamish Hamilton, was also the discoverer of the properties of Pertex (and before that the designer of the original cotton Force Ten tents for Vango). Chris Ainsworth on a ski tour in the Alps, 1983. Rohan Super Strider breeches and Rohan shirt. 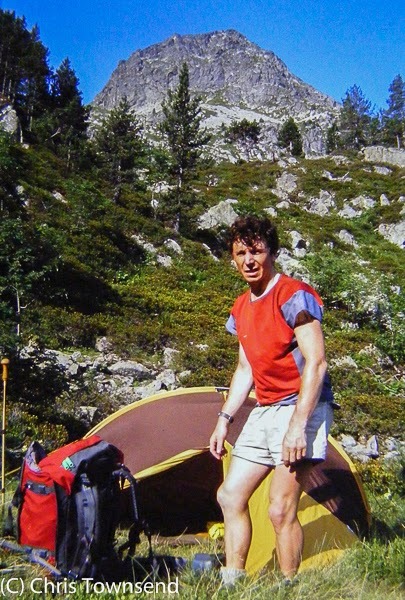 This photo was used in a Rohan catalogue. As well as wool shirts and sweaters and clammy non-breathable waterproofs the walker of the 1970s wore thick baggy tweed or corduroy breeches or trousers. Then along came Paul and Sarah Howcroft and a company called Rohan, just starting out when TGO was launched. Firstly Rohan replaced itchy, heavy wool legwear with stretchy brushed nylon Super Striders, at the time the best cold weather legwear available and the first softshell garments (though the name wasn't used back then). Then for summer came lightweight polycotton trousers and breeches, derided by many (including some who were to make their own versions a few years later) as far too light and flimsy for serious use. They were wrong. My first ever gear review, in the April '79 The Great Outdoors, was of Rohan Summer Striders. I concluded that these polycotton breeches were ideal for summer and went on to wear the trouser length versions, the now-famous Bags, for Pacific Crest Trail and Continental Divide Trail through-hikes. Polycotton dominated lightweight clothing in the 1980s but in 1989 the first synthetic microfibre nylon and polyester clothing was launched and this has taken over, though polycotton is still around. 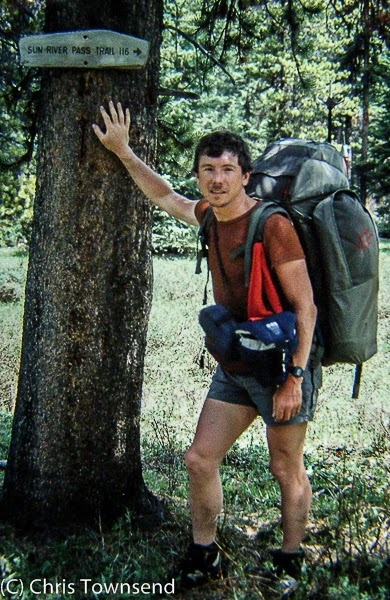 On the Continental Divide Trail, 1985, Rohan Moving On windshirt and Bags trousers. Small rucksacks were much simpler affairs back in 1978. Most were just simple nylon or canvas bags with shoulder straps. A few had padded backs but it was to be another ten years before these were standard whilst internal stiffening, zip round openings, sternum straps and waist straps were all well in the future. Even further away was the rebellion against complex and heavy packs with ultralightweight ones that went back to 1970s designs but using much lighter fabrics. Towering rigid pack frames were still popular for backpacking in 1978 - there's one on the cover of the first The Great Outdoors - though Berghaus were making some inroads into the belief that such frames were needed for heavy load carrying with their internal framed Cyclops rucksacks, a range that, with modifications, is still available today. Karrimor had launched the first Jaguar packs in 1976 but their top-of-the range models were still external frame models as can be seen by their two full-page advertisements in the first The Great Outdoors. By 1983 these external frames had vanished and the first Condor packs had arrived. The company that launched the first internal frame packs, Lowe Alpine, first appeared in Britain in 1978. By the mid -1980s the pack frame had just about vanished in Britain though there were still plenty about in the USA and Scandinavia. And by the late '80s the first packs designed specifically for women were available, Jenny Roberts giving the Berghaus Lady Pulsar 65 a positive review in the December 1988 The Great Outdoors. Some things don't change though. 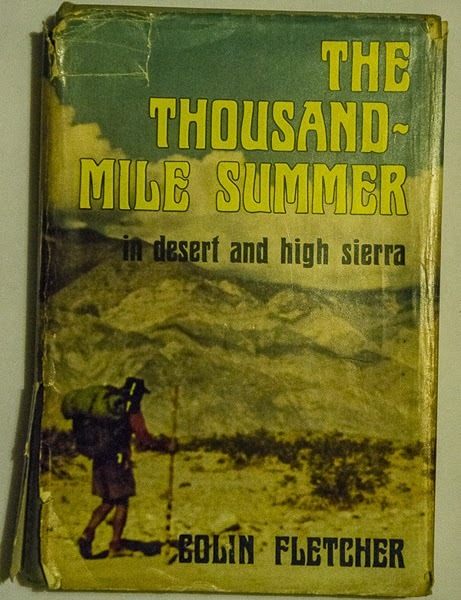 "There seems, however, to be some discrepancy in the methods used by rival makers to find the capacity of their bags," complained Robin Adshead in the first issue of The Great Outdoors. There still is. 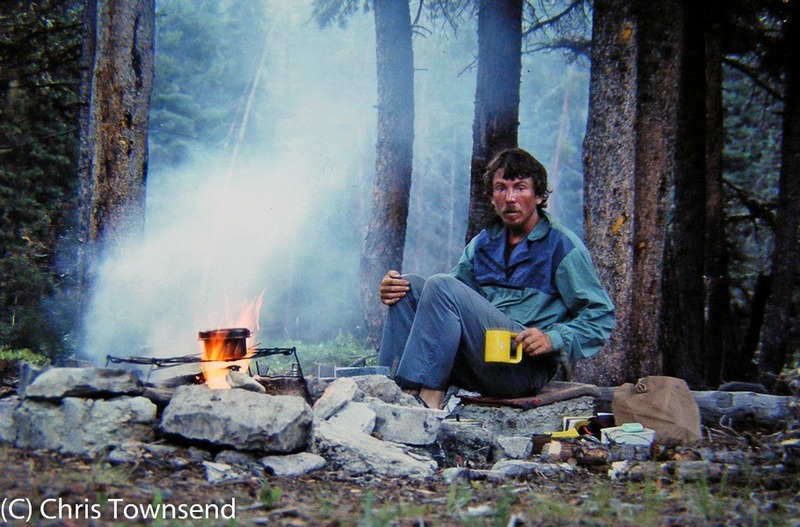 Along with the demise of the pack frame backpackers also saw the demise of the ridge tent, the standard in 1978. 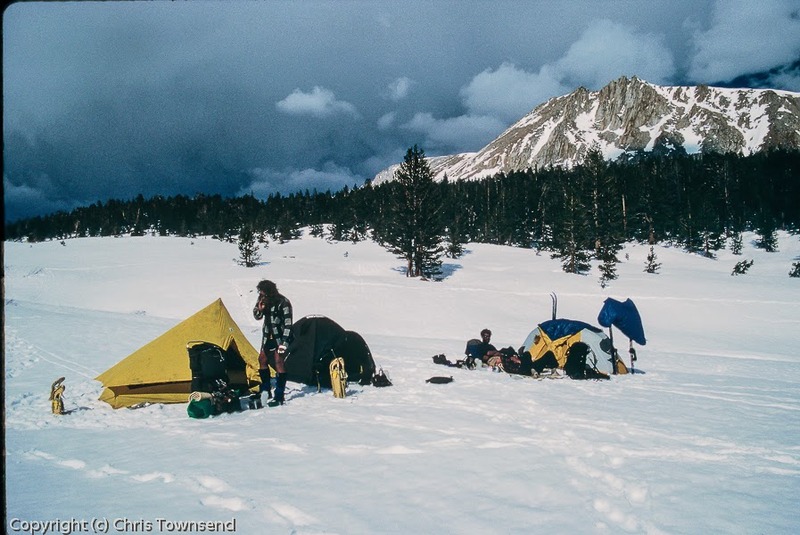 When I wrote the piece in 1991 ridge tents and pyramid tents were rare and seemed very old-fashioned, though they have now returned with the use of trekking poles as tent poles. The big names in lightweight tents in 1978 were Saunders and Ultimate with Vango Force Tens on the heavyweight side. 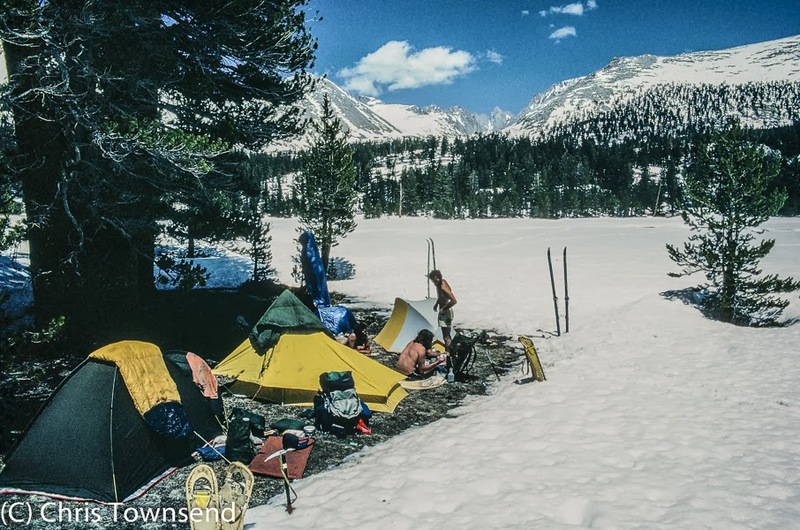 In the May '78 The Great Outdoors Robin Adshead praised the Ultimate Tramp, a sloping ridge model with an A pole at the front, as a "first-rate shelter". I agreed, using one on my Land's End to John O'Groats walk. Flexible poles were coming though and in June 1980 Robin Adshead was reviewing the VE24, a geodesic dome from The North Face. At the same time new companies started to make the running with tunnel tents on offer from Phoenix and Wintergear. Even Rohan got in on the act with a geodesic dome called Xanadu though it never reached the shops. 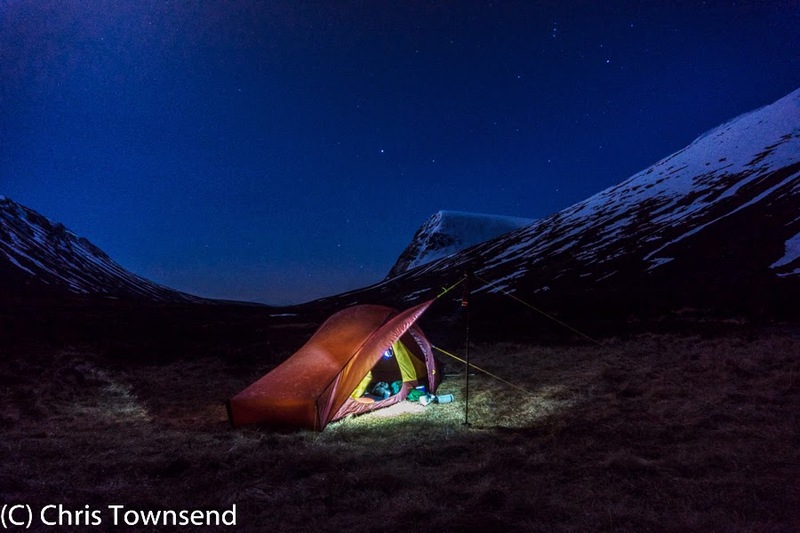 Reviewing the new designs in February 1981 Cameron McNeish wrote presciently that "hoop tents and domes will, I suspect, proliferate in the next few years". Of the many designs, some quite weird and wonderful, that appeared in the early 1980s two were especially significant and haven't been bettered since. Single hoop tents, typified by the Phoenix Phreerunner (1982) and Saunders Spacepacker (1983), gave the most space for weight of any design for solo and lightweight backpackers while the stretched geodesic dome shape of the Wintergear Sapphire has become the standard for lightweight mountain tents. The last name probably isn't familiar but all will be clear when I say that the Sapphire was renamed the Quasar a few years later. 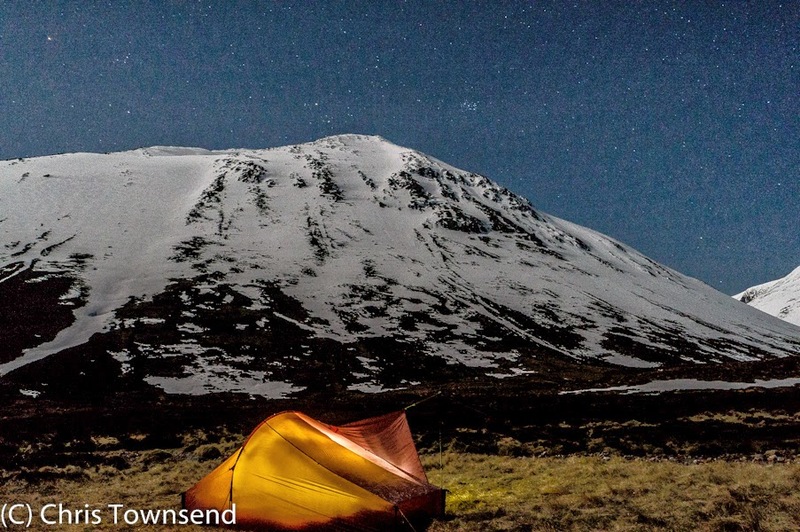 Compared with tents and packs developments in sleeping bags have been less dramatic. Down is still the lightest, warmest, most durable filling though synthetics have improved enormously since Holofill was launched in the autumn of 1977. The mummy shape, only found on top-of -the-range bags in 1978, is now found even on budget bags. In my view the major development was in sleeping mats rather than bags with the arrival in Britain in 1978 of the first Therm-A-Rest self-inflating mats. Using one of these left Robin Adshead so carried away that he quoted Shakespeare: "For this relief, much thanks" (The Great Outdoors September 1978). 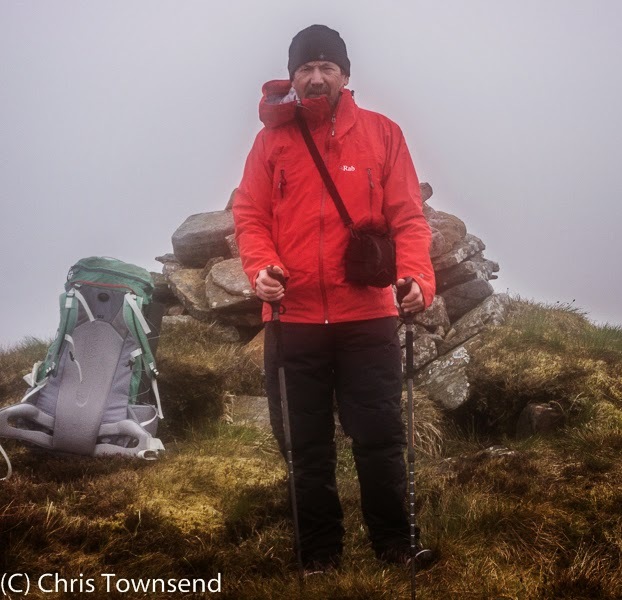 Having used a Therm-A-Rest on many long distance walks since 1981 I can only agree. In 1978 we cooked on ALP and Camping Gaz butane stoves, Optimus paraffin stoves, Svea 123 petrol stoves and Trangia meths stoves. All bar the first are still available. The two big changes have been the replacement of pure butane in cartridges with butane/propane mixes, which work better in cold weather, and the introduction in 1979 of the first MSR stove, the GK, with its unique use of the fuel bottle as the fuel tank. Now this design is standard with models available from Coleman, Primus and Optimus. Two accessories undreamt of in 1978 typified the walker of the 1990s, though their use was still controversial. The first and most visual was trekking poles, which rose in popularity extremely quickly. The first feature on these appeared in February 1992 and it reflected the fact that the writer (myself) only used a single pole at the time. 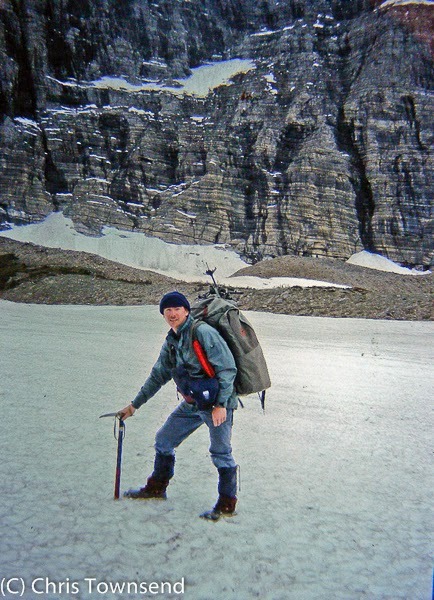 However by December 1994 editor Cameron McNeish was appearing on the cover using a pair of poles, a picture that, along with other covers, provoked one anti-pole reader to accuse the magazine of promoting their use (which of course we were, along with that of walking footwear, rucksacks and other items). The other and even more controversial item was the GPS receiver, a development first commented on in the September 1992 issue when Roger Smith, reviewing the £679 Trimble Ensign, wrote that it was "a development we shall watch with great interest, but for the time being, don't throw your maps and compasses away". The advice is still valid. This rather breathtaking rush through many years of gear leaves me with two thoughts. The first is that I believe that some (note that some!) gear really has improved. I wouldn't like to go back to wearing itchy wool breeches, sweaty non-breathable waterproofs and heavy, stiff, tiring clodhopper boots. I'd also rather carry a stable internal frame pack than a swaying top heavy external frame. But my final thoughts are that gear doesn't really matter. It's only a tool, a means to an end. The wild places, the glorious hills and awe inspiring forests through which our narrow trails wind, are still out there, still the reason we carry packs and camp wild. 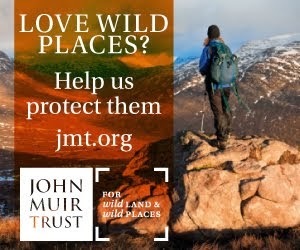 When it comes down to it which rucksack, which footwear and which shelter we use really don't matter. Being out there. That's what it's all about.